You have the most comfortable couch in the history of the world, and you love every second you spend on it, except for when you notice those stains all over it. Let us help you get back to enjoying your favorite piece of furniture with our professional upholstery cleaning service. Upholstery can be a lot more sensitive than carpet. Vigorously scrubbing at your sofa to remove a stain can just cause more damage. Our expert technicians will take the care to ensure the specific fabric and dyes in your upholstery are brought back to being as good as new. Natural fibers like cotton, wool or silk. Synthetic fibers like nylon, polyester or Micro Fiber. This way we know how to best approach the specific cleaning job without causing any harm to the furniture. Once we know what it’s made out of, we can begin our cleaning process. Furniture cleaning requires special attention from trained professionals and the use of tools custom-designed for the purpose. We utilize the best equipment and techniques that will get the job done right the first time. With the aid of upholstery cleaner solutions, our professional team members can bring the color back to your stained furniture. Our furniture cleaning service won’t just cover up the dirt. We utilize powerful tools that enable us to remove the grease and grime from deep within the fibers of your upholstery. Not only will we make your couch cleaner, but we’ll also make it more sanitary. Allergens and pollutants are removed from the fibers during the cleaning process which results in healthier, fresher smelling environments. Kinney’s Carpet Care technicians will provide friendly, efficient service that will have you enjoying your furniture again in no time. We’ll schedule a time that works best for you and have everything looking new again. Who doesn’t love sitting on the couch with their furry friends? While pets are a wonderful companion while binging Stranger Things, they sure can make a mess and stink up your furniture. 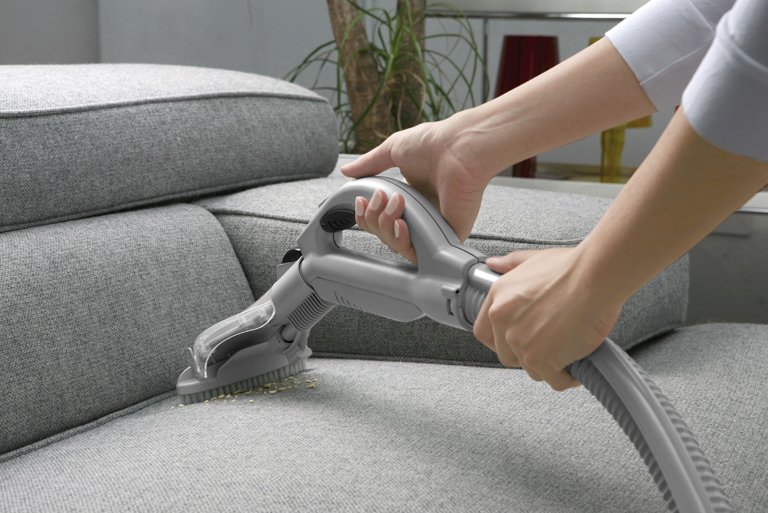 Our trained technicians can get Spot’s spots off your sofa with our couch cleaner service. Popcorn and soda really kick movie night up a notch to a perfect evening. The only problem is when Zach Galifianakis has you squirting the soda out of your nose or when Mike Myers makes you jump out of your seat with the popcorn bowl in your lap. These stains pose no threat to our professional team members. It’s not always your pet’s fault, you know? Whether the kids just came in from playing in the yard or your AC was on the fritz all week, these stains can be a real bother. Just let us take care of all your furniture woes – we’ll have those stains out without a sweat. Let us show you why we have been a trusted provider of carpet cleaning services in Tahoe for over two decades. Call or fill out a request form now so we can schedule an appointment to get your furniture looking and smelling good as new.